Bluetooth, a common technology associated with connectivity, enables devices to get connected with each other without the use of wires. Bluetooth headsets are those that use this wireless connectivity tech that permits the user to use his/her cellphone hands free. The main advantage of Bluetooth headset is the ability to roam without placing the headset on the user’s ear while communicating. A mono Bluetooth headset consists of one ear piece and one microphone which is typically used to make voice calls. Technological advances in this device by various key manufacturers has taken the applicability of mono Bluetooth headsets to the next level. Now-a-days, apart from calling, they can be also be used to hear music. Aspects such as convenience in connectivity, multipurpose use of mono Bluetooth headsets and portability have boosted their adoption since past few years. In addition, besides convenience, mono Bluetooth headsets have become a trendy accessory, more of a status symbol or a want than a mere need. However, the cost associated with this product is usually higher and cannot be afforded by every population class. Also, connectivity and compatibility issues with specific cell phone brands can be a hindrance to the growth of the global market for mono Bluetooth headsets. Transparency Market Research has come up with a new analytical research report on global mono Bluetooth headsets market that covers various insights associated with the growth of the global market. Several factors including trends, key developments, vital growth drivers, challenges and restraints along with intelligence on key market players have been included in this research report. The research report on global mono Bluetooth headsets market covers historical data along with future market projections for a period of nine years covering all the major market segments. 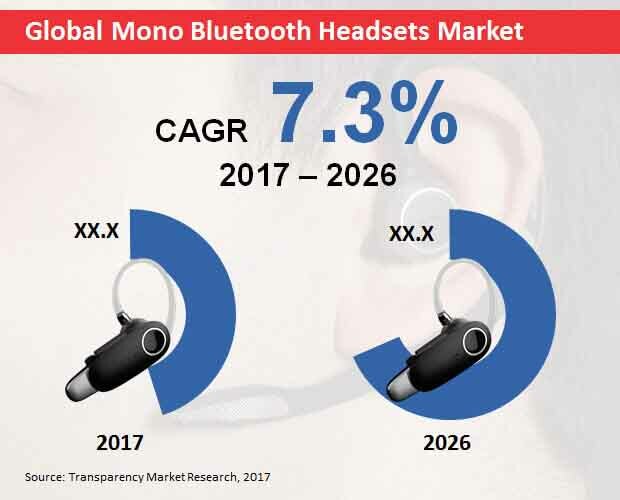 According to this analytical research report, the global market for mono Bluetooth headsets is predicted to expand at a meteoric CAGR throughout the period of assessment and is estimated to reach a value of around US$ 6400 Mn by the end of the year of assessment. Mono Bluetooth headsets have undergone various advancements owing to increasing developments by key players in their respective product portfolios. These advances have pushed the usability quotient of mono Bluetooth headsets making them a versatile innovation that offers convenience to users. The North America region has shown increased inclination towards the usage of mono Bluetooth headsets making this region highly attractive for the market’s growth. Moreover, Europe is also expected to show a boost in the adoption of mono Bluetooth headsets in the years to follow. In addition, Asia Pacific excluding Japan (APEJ) region is anticipated to reflect increasing sales of mono Bluetooth headsets, making this region a potential revenue pocket that can be looked upon as a major investment option in the years to come. Mono Bluetooth headsets have been used predominantly for communication purposes. The use of mono Bluetooth headsets for communication has been increasing across the globe, thus making the communication application segment to be a dominating one. This segment is estimated to reach a valuation of more than US$ 3 Bn by 2026 end and is projected to grow at a significant pace in the coming years. On the other hand, the sports segment in the application category is expected to grow at a value CAGR of 7.4% throughout the assessment period. The informative research report on global mono Bluetooth headsets market covers analysis of various key players involved in the market. Aspects such as company overview, key financial aspects, product portfolio, developments and strategies of the key players have been covered thus offering a complete intelligence package. Major players such as LG, Bose, Logitech (Jaybird), Samsung (Harman), Sennheiser, Plantronics, Microsoft, Panasonic, GNNetcom (Jabra), Widex A/S and MOTO have been included in this research report. The research report on global mono Bluetooth headsets market covers current market scenario along with historical data analysis. Moreover, a future projection for a period of nine years has been portrayed in this research study that gives a complete market understanding to the reader. The base year considered in this research is 2017 and the forecasted year is 2026. Several political, macroeconomic, technological and social aspects that have an influence over the growth of the global market have been slated in this research. Moreover, the magnitude of these aspects across various key regions in the globe have been included that can support the reader in making decisions with respect to expansion. Various trends, challenges, opportunities and drivers that impact the global market have been studies across vital regions across the globe. Also, competitive landscape has been covered which covers key details of the major players involved in the mono Bluetooth headsets market. The research report on global mono Bluetooth headsets market starts with an executive summary, followed by market overview from a global perspective. The market overview section includes market introduction, global mono Bluetooth headsets market size, market dynamics, supply chain analysis, PESTLE analysis, Pricing analysis, Porter’s five forces, product life cycle and overview of key participants. The introduction chapter covers market definition and a detailed market segmentation. The market size has been represented in terms of value (US$ Mn). Following the market overview section, a detailed analysis on the market segments during the 2017-2026 timeline has been covered. Transparency Market Research adopts an exquisite research methodology to garner relevant insights. This research methodology is a blend of primary and secondary research. Secondary research is initially carried out to obtain a wide market understanding. The numbers obtained from secondary research are cross verified through primary interviews. Each data point obtained in one primary interview is validated in the next and the process continues till the conclusion of the market research. This reinforces the credibility of the researched data by enhancing its accuracy percentage. With the help of triangulation method, a single data point representing a particular segment in a particular region as well as global statistic is obtained which reflects highest accuracy and can be used to make informed decisions. The research study on global mono Bluetooth headsets market covers a holistic unbiased view of the market which puts forth several vital insights on the market segments across regions in the globe. The key regions of North America, Latin America, Europe, Asia Pacific excluding Japan, Japan and Middle East and Africa have been assessed. Moreover, sub regional intelligence is also provided in this study. Analysis on key competitors can support the reader in gaining edge over the competition in the mono Bluetooth headsets market in the coming years. With this research report, the reader can slate key decisions and implement strategies to establish a global footprint. Moreover, the facts and figures in this research report follow a structured format that makes it convenient for the reader to examine the study and glean insights from the actionable intelligence provided from the research. In addition, a 24x7 analyst support is provided to handle queries regarding the study should the need be.